The exhibition showcased the history and development of ceramic crafts in Pakistan from Mehrgarh c. 7000 B.C. and the Indus Valley Civilisation c. 3500 B.C. to the present day. It featured over four hundred historical objects borrowed from the Quetta Museum, the Sindh Provincial Museum, the Department of Archaeology (Punjab), the Department of Culture (Sindh) and the National Museum of Pakistan together with private collections. 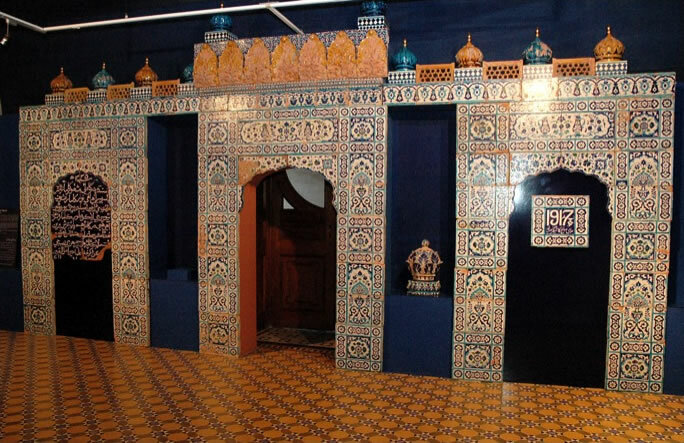 Additional highlights included the recreation of a corridor of pillars and arches from the Shah Jehan Mosque in Thatta, recreated by traditional craftsmen (kashigars) from Hala and Nasarpur, a potters’ atelier with a kiln, a façade from the lesser known tomb of Tahir Khan Nahar in Sitpur and original tiles shrines in Multan and Uch. Exhibits loaned from the Lahore Museum and the Sindh Provincial Museum included vessels and platters displayed at the Great exhibition of 1851 held in London that were to serve as design examples for craft production. A gallery titled The Grammar of Ornament illustrated tile patterns from all over Pakistan along with exquisite plates from the folio, Sind Tiles. This folio, published in 1906 by the Archaeological Survey of India is the only existing documented record of the tiles of Sind and the Punjab. The exhibition was brought into the present with beautiful exhibits in two galleries, one that paid tribute to the ceramicist Mian Salahuddin who died in February 2006 and another displaying the work of modern potters.